For various reasons we cannot announce all the shows at the one time, but (all going to plan) in addition to these listed below we will be squeezing in shows in Canada, Mexico and the USA as well as a trip to South America between now and the end of the year. * Of course we will also have some more European festivals and a few UK shows to announce later in the year too - so keep checking in. and of course we are curating (and playing at) Bowlie 2, Butlins, Minehead, UK from 10th -12th December. The other news this week is the release of the third God Help The Girl single 'Baby You're Blind'. It was written by Stuart and recorded last year featuring the vocals of Linnea Jonsson of Those Dancing Days, and is released as a 7 inch and download. The vinyl is available in some of the better record shops, or can be bought, along with the download from HERE . The song, it's b-side (a new version of 'A Down and Dusky Blonde' sung by Dina Bankole) and the video can be downloaded as a digital package for just £1. If you haven't purchased the God Help The Girl album yet, we still have some of the limited edition hardback book-style CDs in stock in the Belle and Sebastian online store. Thanks & we'll be seeing you soon. Para los que vivimos en México y somos fans de Belle & Sebastian, la noticia es más que emocionante. Esperemos noticias de fechas próximamente y a ahorrar para los boletos. 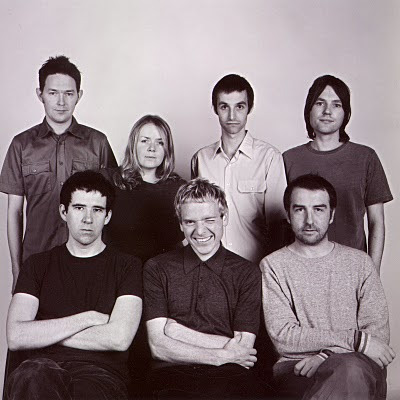 Hoy me encontré en dos páginas de internet que Belle & Sebastian ya han confirmado las fechas para sus presentaciones en México. Según la página del 'Sopitas', el evento en la Ciudad de México será parte de un festival que organiza Ache Producciones (los que trajeron a los Arctic Monkeys y a los que nunca les perdonaran su mala organización). La página oficial del grupo no ha publicado las fechas aún, esperemos más noticias. "and in between - 2 in Mexico: Guadalajara on 7th Oct; Mexico City on 9th. . and 1 in Canada - the Massey Hall on 12 Oct "
"keep checking back to the website for more shows and ticket details when we have them"
El evento comenzará a las 21:00 hrs. Los boletos saldrán a la venta el viernes 25 de junio. Más información en la página oficial del grupo y en Noiselab. También espero que no se repita lo de los Arctic y que todo sea el gran concierto que esperamos. Hay que estar atentos para ver precios y más datos. Un saludo!